Turkish Airlines passengers barely escaped serious injuries after their Airbus A330 skidded off the runway in foggy Nepal and crash-landed nose down in a grassy field. 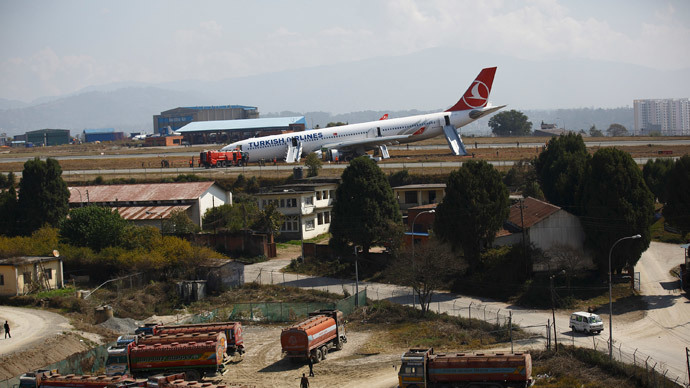 The flight THY726 coming from Istanbul missed the runway at Tribhuvan International Airport in Kathmandu early Wednesday morning. Because the runway had become slippery after two days of rain and because of dense fog, the aircraft bounced off the pavement to land in the field. According to Air Traffic Controller, the Turkish Flight missed the runway central alignment and landed in between the TIA runway and taxiway that forced the aircraft to skid on grassy land. The front of the Airbus 330 was damaged and the plane became stuck in a field. Airport officials said no deaths or serious injuries have been reported on the plane which had 238 people on board, with passengers suffering bumps and bruises. Officials suspect bad weather conditions and low visibility to have been the main causes for the disaster.